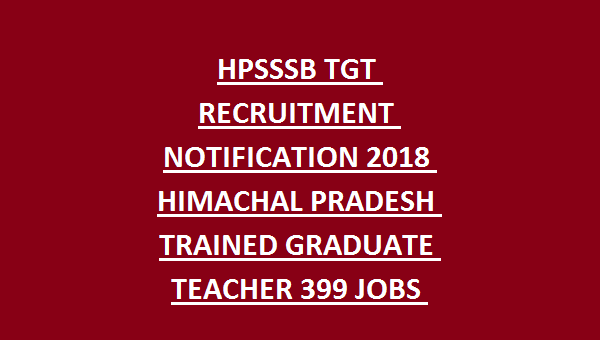 HPSSSB TGT Recruitment 2018 Notification For 399 TGT Arts, TGT Non Medical, TGT Medical Apply Online for HPSSC TGT Jobs @hpsssb.hp.gov.in. 399 jobs on Contract basis. Interested and Eligible candidates can apply online for Himachal Pradesh SSSB official website http://www.hpsssb.hp.gov.in apply for HPSSSB Arts Jobs, eligible candidates should apply online form 23-12-2018 to 21-01-2019. HPsSSB Recruitment 2018 selection process will be based on the performance in the written test and personal interview. For more information about the HPSSSB TGT Jobs vacancies, age limit and education qualification go through the information given bellow. Eligibility Criteria for HP staff selection board TGT Arts Jobs/ HPSSSB TGT Medical, TGT Non Medical Jobs Apply online. 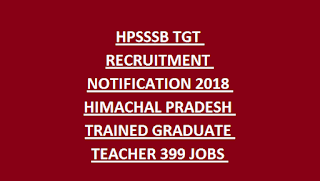 Himachal Pradesh SSSB TGT Jobs having 364 jobs are available detailed information will be given bellow. For the Details about HP TGT Jobs Age limit and relaxation will be given the Official Notification Please go through. HPSSSB TGT Jobs vacancies are based on written test and Interview, Physical Efficiency Test. For more education details go through the notification for details selection procedure and exam pattern. HP SSC official web site http://www.hpsssb.hp.gov.in. Starting Date of online application from 23-12-2018 to 22-01-2019.